For 2017, Coachman’s midmarket Pastiche range has undergone a shake-up. Gone is the nearside fixed-bed 560 and the 470, with its front bed, single side dinette, vast kitchen but no lounge. 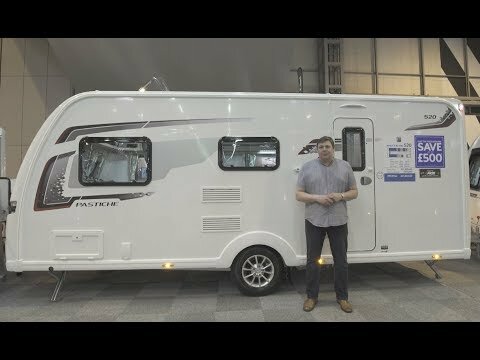 New for this year is the 545, offering an island bed and a mid-transverse washroom, bringing the range to five models. Here we look at the classic 520, which eschews the fixed bed for more living space. This caravan has been revised for 2017. It sports new graphics with a red theme and a new washroom layout. The Coachman Pastiche has a high profile with a gently curving front. An awning rail on both sides hides the bonding between roof and sidewalls, giving the potential to add more ‘rooms’. The body rides on an Al-Ko chassis with a hitch stabiliser and ATC trailer control to help keep things steady on the road. At the front is a large gas locker and three-piece front window, with a panoramic window above. Underneath are standard-sized corner steadies. The bolts for the front steadies are easily accessed through guide holes, but you may have to bend right down to locate those at the back. There are sturdy grabhandles at the front and back to help with manoeuvring the caravan. On the nearside is a gas barbecue point, exterior access to the under-sofa storage and two fridge vents. The glazed entrance door is set behind the axle, has an awning light above and a high-security one-key locking system. A lever door release anchors it to the sidewall when open – it has a wastebasket on the inside. The main control panel is just inside, above the door, and is of the rocker-switch variety. This is great for those who don’t want to fumble for their specs, but you’ll need them to adjust the Alde central heating controls, located on the dresser. There’s a new, large, shallow shelved cupboard just inside the door, with a narrow worktop and a mirror set in an alcove above. It’s a useful spot for plonking keys or charging a phone. A plug socket is positioned on the left. Soft furnishings are in Corsica/Mistral Driftwood, which means a beige/oatmeal material, buttoned in brown velour, with brown velour piping. The scheme is soothingly light and neutral. The seat backs are square, and the sculpted bolsters at both ends have velour trim. The scatter cushions have a geometric design in oatmeal, brown and gold with brown velour trim. Meanwhile, the complementing curtains have oatmeal tie-backs. Cabinetwork is on the pale side, lifted by chrome handles, a graphite-coloured strip on the locker doors, and graphite coving above that hides the ‘halo’ LED ambient lighting. The locker doors have a crank in them near the top to boost internal space – from the hinges, they start with a slope, then straighten. The lounge is made brighter still by a panoramic sunroof and Heki rooflight. In the graphite frame surrounding the sunroof are two LED lights above, two light switches on the left and a mains socket on the right. The graphite detailing is taken into the front corners, where the speakers are set. There’s a useful shelf under the sunroof and a windowsill under the three-piece front window. In front of that is a central chest, with two drawers and a pull-out occasional table. In its base is an alarm sensor. The front corners of the roof lockers have a quarter-circular wood panel hiding halo lights; the effect is subtle. In fact, you have lots of lighting options, including acrylic-rod spotlights at the four corners of the lounge for reading. There’s a light switch below the lockers on either side. The offside seat base has a mains socket. In the offside corner is the CD/radio player. The Coachman Pastiche 520 has a good kitchen, although having the cooker next to the entrance door is not ideal. However, siting the hob and sink beside each other frees up workspace to the right. The Thetford Caprice MkIII cooker has a dual-fuel hob and a separate oven and grill. The large black enamel sink has a chrome swan-neck mixer tap. Both the hob and the sink have glass lids, while a separate drainer extends worktop space. In the kitchen area, the cream locker doors retain the graphite strip and chrome handles, and the graphite coving with halo lighting. One locker has racking for crockery, the other has no shelves. The microwave is set high over the hob in a flush-fitting housing. Between the oven and fridge are a drawer and cupboard. Just above the fridge, tucked discreetly below the protruding worktop, is a slim cutlery drawer. On the offside, the lounge is separated from the single dinette by a dresser. Here you’ll find the Alde heating controls, and TV and mains points. There’s plenty of room for a freestanding TV and space to put down a glass of wine. Under the worktop is shelf space only accessed from the lounge, ideal for books and magazines. Above the controls are three narrow shelves. Below the worktop and alcove is a cupboard. The most disappointing aspects of this area are the single mains socket in the kitchen and the very small rooflight. The biggest change to the 520 for the 2017 season is in the washroom, where the cramped circular shower cubicle makes way for a large, square, fully lined, moulded unit. A graphite panel backs the chrome showerhead and there’s a moulded shelf for bottles. Adjacent is a narrow cupboard with storage space for the freestanding table. However, it is set high, so the table may be awkward to retrieve. An oblong basin with chrome mixer tap sits over a shallow cupboard. There’s no vanity space, but a backlit mirror above has a narrow shelf, and to the right is a chrome tooth-mug holder. A shelved cupboard sits above the heated towel rail to the left of the basin. Above the toilet is a frosted window and narrow shelf. There’s hanging space in the large corner wardrobe, as well as a laundry bin in its base and two drawers below. Two LED spots, a shower light, the window and a rooflight illuminate the area. Towels can be hung on the heated rail, a ring on the door or on a hook on the side of the wardrobe. The Coachman Pastiche 520's front double is made by pulling out a frame from the offside and rearranging the cushions. It’s a decent size (6ft 7in x 4ft 11in) and can also be used as singles (each 6ft x 2ft 4in). The dinette makes up into beds by using the table as a base and pulling out the cantilever bunk, which is reached by an aluminium ladder. Three overhead lockers have LED strip lighting beneath, and a curtain screens off the area for privacy. The offside front seat base houses the boiler and consumer unit, but the nearside one is free to fill with bedding. Four lockers at the front and three over the dinette should hold clothes, and there is the large wardrobe in the washroom. If a family is using this caravan, the dinette seat bases can hold bedding. The kitchen has just two overhead lockers for crockery and groceries. The cupboard between the fridge and oven will most likely be used for cleaning materials. There’s extra space across the aisle in the narrow dresser, as well as the three lockers above the dinette. As you walk through the entrance door, the impression is one of space. The cooker immediately to the left may not be ideal, but the kitchen still works well. Couples and small families who prefer using their own facilities will be pleased with the revised washroom, which gives more space to the shower and more legroom around the toilet. We see the Coachman Pastiche 520 as a sociable couple’s van with space for occasional tours with the grandchildren.